Stove burners come in several varieties. Some have electric coils, some are gas burners surrounded by grates and others are simply inset on the flat surface of the stovetop. Whatever type of burner that you have, if you cook regularly, you are likely to see food grime buildup on your stove burners. Fortunately, with regular cleaning and proper technique, you can remove any grime before it detracts from the overall cleanliness of your kitchen. 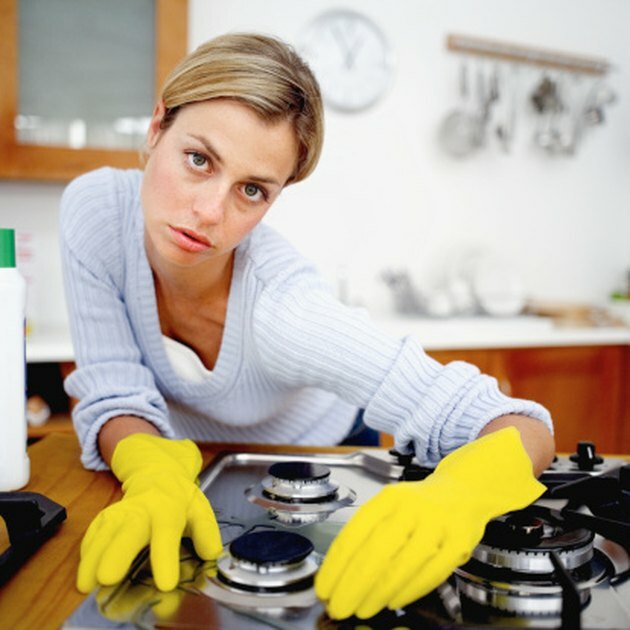 Clean your stovetop regularly to avoid grime buildup. Dip a sponge into warm water and wipe the entire surface of the grates, burners or flattop with the sponge. Remove the grates and caps from a gas burner. For a coil electric burner, remove just the drip pans from the stove. Soak the grates, caps or drip pans in very hot water mixed with liquid detergent and a teaspoon of ammonia for 30 minutes. If you just have a flat stovetop, scrub the stovetop with a non-abrasive pad dipped in a mixture of water and a liquid stovetop cleaner. Scrub the grates, caps or drip pans with a stiff brush after they have been soaking for thirty minutes to remove any stubborn grime. Wait for the pieces to air-dry before replacing them on the stovetop.